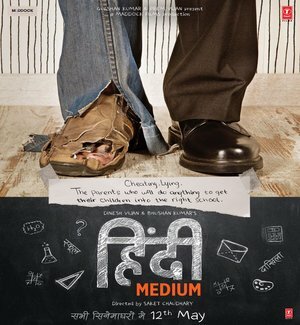 Hindi Medium is an Upcoming Bollywood Film in 2017, It is Drama, Comedy Film and Irrfan Khan, Saba Qamar in lead roles. This film is Directed by Saket Chaudhary and Produced by Bhushan Kumar, Krishan Kumar. It is made under the banner of T-Series, Maddock Films. Hindi Medium is scheduled to release on 12 May 2017. The film is a story about couple’s struggle to get their daughter admitted to a posh English school in order to survive in this society and also prevent others from befooling her. Those who have made the rounds of schools to get admission in their real life, they will be able to relate it altogether. A Hindi-speaking father, who tries to learn English according to the parents and school standards of schools revolving around, shows a bitter look at the thinking of the society. There is a scene in the film where the lead of Saba Qamar, Irrfan asks the spelling of the swimming pool and in the sense that they tell this spelling, you will laugh and laugh.